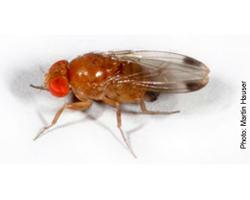 Spotted Wing Drosophila (Drosophila suzukii), SWD, is a recently introduced new species of fruit fly in the United States. It was first found on the west coast in 2008, but has rapidly colonized many fruit producing regions of the country. It was found in New England in late summer 2011 shortly after Hurricane Irene and caused significant crop damage in fall raspberries among other crops. While fruit flies (or vinegar flies) are nothing new in the US, this species is different in it's ability to infest healthy fruit. Other species typically infest over-ripe or damaged fruit. Females of this species have serrated ovipositors that can cut into healthy fruit to insert eggs. This can lead to problems with deteriorating fruit in the field or with customers who find multitudes of larvae in fruit after harvest. This insect has been devastating for fruit crops. Vegetable crops are less susceptible to damage, but greenhouse tomatoes and a few other crops may develop problems. The first step in dealing with this new pest is identification. Spotted Wing Drosophila is a small vinegar fly. Both males and females have red eyes. Males have two spots on their wings, which is a key identifying feature. Females lack the wing spots but have a robust and serrated ovipositor that distinguishes them from other species of fruit fly. Seeing the ovipositor requires some magnification; a hand lense will do.